Bulletproof barriers, troops at hitchhiking posts and expanded operations: IDF implements new policies after recent spate of terrorism. The IDF stepped up its security measures in Judea and Samaria amid a recent upsurge of terrorism in the region. After two recent attacks at hitchhiking posts in Ofra and Givat Assaf, soldiers reinforced bus stops and central traffic arteries all throughout Judea and Samaria. 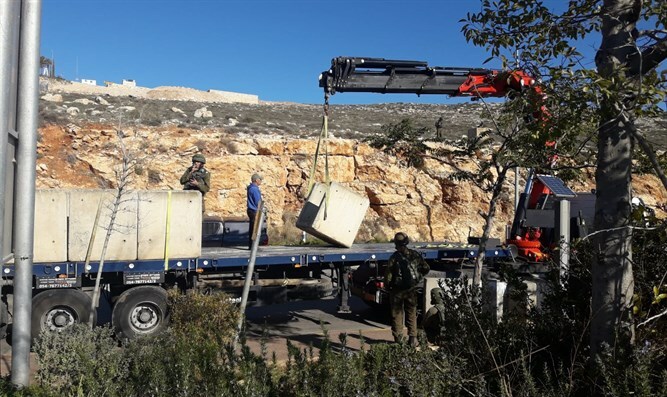 The military also flooded the terror-struck Binyamin region with troops over the weekend to thwart potential copycat attacks. In addition, the IDF added bulletproof barriers at 120 bus stops and other places that often have a large volume of people. "The IDF, the Shin Bet security service and the police are currently operating in the Judea and Samaria area, using overt and covert means to arrest those responsible for last night's attack at the Assaf Junction and the military post near Beit El," Brigadier General Eran Ziv, who commands the Judea and Samaria Division. "At the same time, we continue to act with the aim of preventing and thwarting the next attack, while reinforcing the defense efforts in the roads and in the settlements. We will continue to make every effort to protect the citizens of Israel wherever they are, with reinforced forces." The stepped-up security comes as IDF soldiers continue to search for the terrorists who carried out Thursday’s terrorist attack in the Binyamin region community of Givat Assaf, murdering two soldiers and wounding a third, as well as a 20-year-old woman. The attack was the second shooting attack this week by Hamas terrorists along Highway 60 in the Ramallah area. On Sunday, Hamas terrorists opened fire on a group of Israeli civilians outside of Ofra, wounding seven. Earlier on Friday, a terrorist infiltrated the town of Beit El and attacked a soldier, throwing a large rock at his head and stabbing him. The soldier was evacuated to the Hadassah Ein Kerem Hospital in Jerusalem in serious-to-moderate condition.